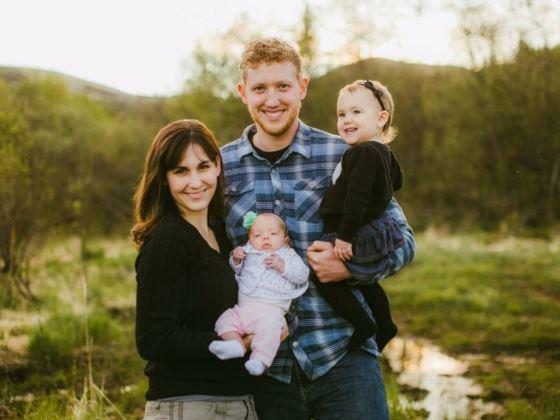 The remains of Pilot Kyle Stevens, age 31, were recovered on October 20, 2017 in the Yukon River near Russian Mission. He's pictured here with his widow Ella, and their two daughters, Kate, age two, and Lauren, seven months. The remains of Kyle Stevens have been found. Missing after taking off from Russian Mission last week, Stevens’ body was recovered Friday in the Yukon River near the village. The crashed plane was found days earlier. Using sonar, State Troopers recovered the body under 20 feet of water and sent it to the State Medical Examiner’s Office in Anchorage. Stevens’ family has been notified. Stevens’ family flew to the Kako Retreat Center after Kyle was reported missing. Rodkey says right now the Center’s priority is helping the family grieve. That includes Stevens’ widow Ella and their young daughters, Kate, age two, and Lauren, seven months. Stevens, age 31, was well known to many in the region. “It’s just hard to describe the impact that Kyle has had on so many people,” said Rodkey. Stevens helped lead the youth camps at the Retreat Center over the past 12 summers. Last year, he moved to the Center from Southern California with his family to live and work full time. Rodkey says that Stevens has worked with possibly thousands of children from across the Yukon-Kuskokwim Delta. Stevens took off from the Kako Retreat Center last Monday in his small Cessna airplane to pick up volunteers in Bethel. A dam had broken at the Center, wiping out the water pump house and a storage shed, and the volunteers had offered to repair the damage. But Stevens never arrived in Bethel to pick them up. His plane was reported missing and another pilot reported heavy fog in the Russian Hills. That evening the Civil Air Patrol and the National Guard launched an aerial search. The next day, searchers found Stevens’ maroon airplane about 10 miles downstream from Russian Mission. The search continued until they found his body on Friday. The memorial service for Kyle Stevens will be held in Huntington Beach, California in November. Update: On Tuesday at about 1:36 p.m., Kyle Stevens' family was notified that the wreckage of Stevens' plane has been found. Kyle Stevens himself is still missing. KYUK's reporting on this story is ongoing. Local volunteers and law enforcement are searching the area for Kyle Stevens, age 31. Courtesy of Anna Kraft Photography. Update: At 4:35p.m., Trooper Spokesperson Megan Peters confirmed that the plane found in the Yukon River is Kyle Stevens'. Stevens himself has still not been found. Kyle Stevens’ plane may have just been found, although Stevens himself is still missing. It’s been three days since Kyle Stevens disappeared, and search and rescue workers still haven't found him.